It’s Friday here in sunny South Florida! Easy Clocking has just made it through another formal business week. With each week that passes by, Easy Clocking finds new, interesting customers that find our Time & Attendance software useful, such as Kaolin Mushroom Farms, the third largest mushroom producer in the United States. “The company continued to grow through acquisitions and expansions, and today it is the largest mushroom producer in Chester County and the 4th largest in the US. Kaolin has 800 full-time employees, of which approximately 80% originate from Mexico. It operates three mushroom farms, a state-of-the-art composting facility, and other related operations, and sells over 1 million pounds of mushrooms every week, primarily throughout the eastern half of the US, to various retail, wholesale, foodservice and process customers. Aaron, how has our time and attendance system affected you and made your job easier? Through a series of integration meetings, we were able to sit down describe our company’s day to day workflow, as well as our needs. Your team then helped incorporate our needs into your version updates, and OVERALL we are very happy with the way the system is working. It’s actually created enough of an influence on our workflow for payroll that we have recently been able to free up positions so that people who were doing other types of payroll with our other system now have some free time they can dedicate to other areas. So it’s definitely helping us in that regard. So it’s helping your productivity? You would say? Yeah, so the productivity and management of individuals has increased quite significantly, because we have more control over the individuals on an hourly basis. With training we’ve been provided and the training that we’ve provided to our staff, like I just said we’ve pretty much eliminated a full position in payroll and freed that person up to do some other things, which was really nice to see. Also, because we are in the mushroom industry and some of our harvesting personnel are very transient and have a lot of turnover, the ability to run reports on who was here, when they were here, and the who was in feature work well, and we’ve also designated certain high-level individuals within each department as different departments, so when we get our notification for time off or so forth it doesn’t have to go to everybody in the department now that we have designated who will be approving it. So, I guess you can say we have basically worked with this system and been able to make the solution work for our way of doing things, and overall we are very happy with it. Once in a while if a clock goes down (network cable), we just go and get it back online and now that we have finished our transition from our old system, everything seems to be going very well for us. Oh, okay I’m glad to hear that, Aaron. In terms of your previous system, what were you using previously and what made you seek a better time and attendance solution? Before, we were using an application that we had produced here within our company. You know, pretty much just a scheduling application so that payroll can monitor which people are working their scheduled period of time. For the hourly employees, we did the traditional time card punching with paper, and then we’d have to grab all that paper together and we would create spreadsheets that would allow us to manage that time and submit it to payroll. The ability to look at something as a web interface anywhere you want, anywhere in the world, as long as you can log on is very helpful to people. Now we’ve gone from old school paper clocks to fingerprint capture technology, and that also has been working very well. There are instances where a couple of our staff members have a difficult time with it. Due to the nature of our work, some people have really rough or difficult fingerprints to capture, but for those individuals, we’ve provided a code to use in the event the fingerprint doesn’t work. That way, they can still log in and their time is captured. We also use individuals who are hourly and allow them to use PC’s to clock in and out. Can you tell us a little about your organization as a whole? So our system definitely aids in your organizational process, you would say? Oh Yeah, it definitely aids. It gives us the ability to manage, especially at higher levels. It gives more accountability and makes transitions so much faster when walking from the breakroom or walking to the breakroom and punching in with paper time cards. With this system, they get immediate recognition of whether or not what they did was valid, and they have been shown to wait or move to the next clock, but in general, yes it’s been very helpful as far as productivity, because it’s allowed the managers to eliminate the time it took to do all the number crunching on paper. Instead, they can easily click and edit right here on the screen. Aaron, what is your position at Kaolin, if you don’t mind me asking? Laughs** I see, so you get the pleasure of learning all the new technology and integrating all the new things that Kaolin rolls out. So you could call yourself an implementation manager of some sort? Kind of! I work hand in hand with John Pia Jr., who is the IT manager. He does all the implementation with scheduling, and it’s up to me to learn the product and gather the information and run the trainings for everybody. How long have you been with Kaolin? I’ve been with them for 4 years but I’ve only been in this position since May of 2015. That’s great. That’s good to hear. So, Victor do you have any more questions for Aaron. I was going to ask before we wrap up, is there a particularly us in our system for the hourly employees that you rely on the most? Yeah. I would say, since our work staff is nearly 1000 people, and at least 850 of them are hourly, this has created quite a management, it has gotten much more easy to manage these individuals, because we have this easy clocking setup now. The fact is, now we can reach back and grab reports, the ability to let individuals who say they weren’t here know they were here and that we have their fingerprint and have captured their time. How much money do you think you’ve saved implementing this system? Oh GOODNESS! To get the most accurate number, you would have to speak to John about that (IT Manager). But, I remember when we first started we saved enough personnel time to allow the elimination of an entire position from our payroll. Yeah, so that’s definitely enough to say that over the course of a year the system would end up paying for itself? I would say so. Yes… Because the transparency of looking at and managing everything, and how granular you can get to restricting individuals access and all that stuff is very, very beneficial for us. Like I said, we had to work for many implementation meetings to get it to work our way. Management really enjoys the fact that they can manage their staff without having to hinder their time. Would you recommend us to other companies based on your experience? Oh yeah definitely! Matter of fact we even want to upgrade to the new clock you guys have coming out, the Xenio. However, we just completed our integration, and in order for us to upgrade, being that you guys have updated your fingerprint technology even more, we would have to re-enroll our employees. We would have to start from step 1 again. We would gain a bunch of options but would have to recapture 800 fingerprints. Yeah regaining the fingerprints is definitely the biggest pain in the integration process! I wouldn’t want to redo that process. But the Xenio is definitely a much better system with the upgrade to the firmware and OS. Yeah, well everything seems to be working just fine. The managers are handling the system really well, moving from hourly to salary positions, and moving from biweekly to weekly pay periods is easy, I mean things went from many calls a day to a couple calls a week from our staff asking questions about easy clocking. So, we know everything is working and things seem to be stable enough. Unless a clock goes down or unless we have a special case when an hourly employee stays more than a night or two to mess up his schedule, unless it’s one of those two cases, our IT team doesn’t get any complaints or calls about the system. Everyone is pretty happy with it. Well Aaron, I had a pleasure speaking with you! Thank you once again. Okay thanks guys! Great speaking with you! Bye! Are you prepared for the changes coming December 1, 2016? The Department of Labor recently published changes to overtime policy which will significantly change employee overtime eligibility salary thresholds. With upwards of 4.2 million workers to become eligible for overtime under this new policy change, it’s imperative that you find a system to managing your employee data. The Fair Labor Standards Act will affect millions of businesses. According to the new law effective December 1, virtually all employers are to pay most employees at least the federal minimum wage requirements. for certain employees who work in ADMINISTRATIVE, PROFESSIONAL, EXECUTIVE, HIGHLY COMPENSATED, OUTSIDE SALES, and COMPUTER PROFESSIONAL JOBS. Employees fitting under Administrative, Professional, Executive, Highly Compensated, Outside Sales, and Computer Professional positions are known as “exempt” positions. In order for an employee to be considered “exempt”, these employees must generally satisfy three requirements which focus on how an employee is compensated, as well as the type of job duties he/she performs. Meet Job duties exemption requirements and have a salary ranging from $23,660 and $47,476 per year. Meet the Highly Compensated Employee (HCE) job duties exemption requirements and have a salary ranging from $100,000 and $134,004 per year. The Department of Labor will increase the salary threshold every three years. Based on current projections, the salary threshold is expected to rise to more than $51,000 with its first update on January 1, 2020. With the department of labour forecasting a shift in overtime policies now is the time to protect your business and look to invest in the versatility offered by a Smart Time Clock System. 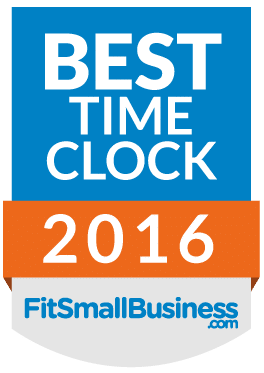 Time-Logix is making noise around the way and just won Best Time Clock for Small Business of 2016 by Fit Small Business. Recently, Fit Small Business compared 3 of the best time and attendance solutions on the market. Easy Clocking’s Small Business solution Time-Logix was voted the #1 Time and Attendance solution. Small businesses are often overlooked but are in fact the foundation of what makes America great. TimeLogix stands by small businesses nationwide in providing an affordable, scalable solution fit for their business needs. Time-Logix, developed by the same team that brought you the Easy Clocking Time and Attendance system, was founded with the goal of taking care of those businesses for which every dollar makes a difference. Built on a similar platform and infrastructure as the Easy Clocking system, the Time-Logix Cloud Based Time & Attendance Software offers the stability and reliability renown within our Easy Clocking systems at a fraction of the cost. Small businesses can benefit in knowing that the initial cost investment of a Time-Logix is backed by Easy Clocking’s technical expertise. As your needs grow and businesses develop, Time-Logix can easily be upgraded to an Easy Clocking system in order to better service your growing business needs. Below you will find Easy Clocking’s time and attendance software release notes for the 2.16 release. Our company is constantly looking to make improvements to our Time and Attendance suite if you have any additional comments or concerns please feel free to reach out to us directly by phone or by comment! Project Classification Projects can now be classified as ‘Capitalized’ Yes/No. To enable this classification, it needs to be set at the projects and job settings. Timesheet Bulk Approval Bulk approval of Time Sheets is available with this release. All timesheets that are submitted can be processed as bulk and approved. Accrual Past Start Date With this release, the accrual start date can be set at creation or edited afterwards to a past date. Only time-based accrual hours can be modified to a past start date. Exact Value for Accrual Carry Over Now accrual carry over can also be indicated as an exact value. Earlier only percentage value was available. Who’s In Job Code With this release, the last job code is displayed in the Who’s In Tab for each employee. Earlier the first one was. Decimal Accuracy for Accrual With this release, up to four decimal accuracy is available for absence accrual. This is done at the absence type setting. Changes to Holiday Absence Type With this release, the holiday absence type can be considered regular counted towards weekly OT or not. Also the worked hours can be paid as OT directly with a rate multiplier. Anniversary Report In the general category there is the anniversary report now to show the employee anniversaries. The filter can be monthly or for multiple months. Terminated/Inactive Employees In general category there is now a report to show both inactive and terminated employees. Weekly Schedule Report This is a weekly schedule report now displaying location, time and job. The report is printable in an easy to read and present format. Timecard Weekly Report The report was displaying wrong dates in the report compared to the selection of date period. Actual Vs Scheduled Report The schedule changes and out of shift approvals were not properly being calculated. With this release the calculations are corrected. XENIO Questionnaire Integration With this release, Xenio line of smart time clocks are fully integrated into the Time and Attendance software for managing and reporting on questionnaire functionality. Punch and Breaks Integration With this release, Xenio line of smart time clocks are fully integrated into the Time and Attendance software for managing punch and breaks functionality. This includes both indication and restriction of punches and breaks.